seattlefrank: TaB Makes a Comeback? I haven't seen the original saccharin-sweetened Tab in my local grocery for a number of years, though I've heard from friends that it occasionally does crop up. Contrary to popular belief, it has not been discontinued--it's just keeping a low profile. So low, in fact, that it's not even listed on Coke's "domestic brands" website. Tab is still canned (not bottled) by the Coca Cola company, just as it was more than 40 years ago when it was introduced in 1963. Currently, it's in what's called "limited supply," but die-hard addicts and/or retro fans can still find it in their local specialty beverage store; if not there, then online, for sure. While there are undoubtedly thousands of Tab afficionados out there today, it's nothing like what Coke had on its hands in the early days when Tab's popularity was absolutely over the top as it became the country's first widely-accepted diet soft drink. I remember becoming semi-hooked on it myself as a teenager and I still recall that crusty, over-carbonated, charcoal taste. Yes, the pink can was effeminate, but the satisfaction of drinking a decent-tasting pop without the toothrotting, fat-adding sugar was worth it. And it made a great mixer. We always had some around our house and I'd buy some now in a minute if I could find it. You'd think that would be enough to scare off most people, and it did. But like its petro-chemical aftertaste, Tab's appeal lingered and it continued to be popular into the early 80s, when it was supplanted by Diet Coke. It wasn't clearly understood until years later, that to have even the slightest statistical carcinogenic effect (even in rats, which metabolize foods differently from humans), one would have to drink several gallons of a saccharin-sweetened softdrink daily--for virtually a lifetime. But the damage had been done and unlike America's waistline, Tab's appeal waned as Diet Coke and other non-saccharin diet soft drinks came onto the market. Unbelievably, it wasn't until late 2000 that warning labels were no longer required on saccharin-sweetened products--after more than 20 years of study. 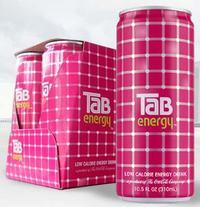 Flash forward to 2006, when I was reading an article in the Feb 6 New Yorker, that the Coca-Cola company is resurrecting the Tab name into a new drink called Tab Energy. Yes, it will be in the vein of uber-popular Red Bull and other highly-caffeineted power drinks, but will now be sweetened with Sucralose. As with the original Tab, it will be marketed toward women, as the slimmed-down 10.5 ounce cans with their "fuschia gingham" color scheme testify. With three times more caffeine than classic Tab (which had plenty to start with), a different sweetener and a little sugar, the new Tab will not taste anything like the old Tab--probably a good thing. Test marketing is well under way and you can expect a marketing blitz later in the year. a penny? I’m not very web savvy so I’m not 100% positive. topic, it might not be a taboo subject but typically folks don't discuss these issues. To the next! Best wishes!! up? I’m assuming having a weblog like yours would cost quite a penny? I’m not to web savvy so I’m maybe not 100% positive. Hi great web site! Does writing a blog similar to this demand a massive amount work? I've virtually no expertise in programming but I was hoping to start out my own blog soon. Anyway, when you have any some ideas or approaches for new blog owners please share. I realize that is off topic however I just needed seriously to ask. Thanks a whole lot! Could it be very difficult to create your personal blog? I’m not very techincal but I can evauluate things pretty quick. I’m contemplating creating my own but I’m unsure the place to start. Have you got any some ideas or suggestions? You're so interesting! I don't suppose I've truly read anything like that before. So good to find another person with genuine thoughts on this issue. Really.. many thanks for starting this up. This site is one thing that's needed on the web, someone with some originality! It appears as if some of the written text inside your content are running off the screen. them aswell? This might be a issue with my browser because I’ve had this happen before. several simple adjustements would really make my weblog stand out. I've a venture that I'm just now working on, and I've been on the look out for such information. What's up, for all time i used to check blog posts here in the early hours in the break of day, because i love to learn more and more. Truly no matter if someone doesn't understand afterward its up to other people that they will assist, so here it occurs. the whole thing. Are you experiencing any tips for inexperienced blog writers? Currently it appears as though BlogEngine could be the top blogging platform on the market at this time. inexperienced blog writers? I’d genuinely relish it. of the comments appear like they are left by brain dead people? :-P And, if you are writing at additional online social sites, I'd like to keep up with anything new you have to post. Could you list of the complete urls of all your community pages like your twitter feed, Facebook page or linkedin profile? I don't have time to read it all at the moment but I have book-marked it and also included your RSS feeds, so when I have time I will be back to read more, Please do keep up the awesome job.